We Design, Develop and Maintance websites with conversions in mind, our websites look great, but each page has a clearly defined conversion goal. The goal might be to make a sale, to leave an enquiry or to sign-up for a service, but it is always there and always very clear. 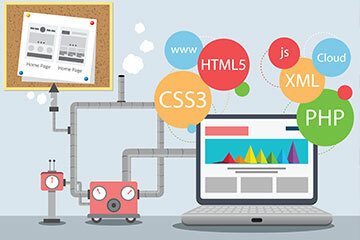 Our web developers and designers use the latest techniques to design accessible and effective websites. Techniques like responsive design that allow your website to present naturally on a mobile device are of utmost importance for today’s website. From custom designed websites in Photoshop, and committed to html and content management systems such as Drupal, Joomla and custom CMS, through to simple WordPress or e-commerce websites using stock templates or custom developed templates. Our web department has an extensive list of skills and techniques to share. Our web department has an extensive list of skills and techniques to share.